For two weeks in May, June 2007, Sabrina and I cruised the Mediterranean aboard the Emerald Princess. Most of our packing was completed yesterday. Flight today was at 5pm, which meant we had a lot of time today to complete final details. It was our most calm and controlled vacation departure yet. Drive on the 401 was smooth for us, heading east. Beautiful blue sky day. Poor suckers heading west had to contend with a tractor-trailer collision that closed all lanes. It was a parking lot for miles. People hanging around outside their cars. Ok, the kids in the row ahead weren’t a problem. Rather cute actually. Flight was uneventful. Watched Eragon, and read a bunch of Lord of the Rings (again). Utterly bereft of sleep, as usual. Landed in Frankfurt at 7:00am on the next day. Starting our first day in EU with no sleep. I have a feeling we may miss our first booked excursion in Marseille tomorrow. Frankfurt airport immediately lets us know we’re in Europe: people smoking indoors. With the lingering after-effects of a cold, my throat doesn’t like it. Cleared EU customs easily enough. Then security again. A rather more thorough probing with the metal detector than I’m accustomed to. There’s apparently some metal in my shoes, they wanted to x-ray those too. Nobody seems to be doing the old bomb-swab test on electronics anymore. Not in Canada, and not here. Strange. But they do have that stupid restriction on liquids, though. There were two other couples in the security line with Princess Cruises baggage tags. It seems they’re going to the same place we are. Then an incredibly long walk to the gate for our connection. Our next flight was a bit more comfortable. Operated by Lufthansa. Same kind of plane (Airbus A330? ), I think, but the seats seemed nicer and roomier. Sabrina slept through most of this flight. They came and offered snacks. Sandwiches. They just said “Cheese or turkey?” Sabrina, being rather groggy, thought “I can’t eat a whole turkey.” I saw she was somewhat confused, and told her it was sandwiches. Arriving in Barcelona, we collected our baggage. It was very late coming out… We were afraid they had lost our luggage, yet again. But at last they appeared. The Princess Cruises rep gathered us all up, and took us across the street to the buses. The drive to the cruise terminal is about all we saw of Barcelona. The coolest thing was some apartments or condos we passed that were built into the side of a cliff, looking out over the sea. It was only when we got much closer that we noticed they were all actually really, really small. Just a few feet high, with a single window. And lots of crosses everywhere. We realized it was actually a cemetery! But a cool cemetery. The cruise terminal was a very new and modern one, much nicer than the one in Florida. Our check in was completed very quickly, no hassles whatsoever about Turkey. Talking to the Turkish embassy, and Princess Cruises, we were never able to get a solid answer about whether or not Sabrina needed a visa. Or rather, we got many solid answers, but all mutually contradictory. In the end, we decided to believe the Turkish embassy, and their web-site, who said she doesn’t need one. Fortunately, it worked out. Once in our stateroom, Sabrina lay down for a nap for a couple hours. I knew we would have to be awake and ready for the usual emergency procedure drill, so I didn’t want to sleep yet. I explored the ship for a while, and had a beer at the outside bar on the aft of our deck. After the emergency drill, we went to get supper. We found the dinner to be absolutely delightful. I had a spinach/tortellini soup and main course of luau pork with apricot sauce. Sabrina had a kind of seafood/lobster cake, and main course of something like jambalaya. Dessert was a fruit plate for Sabrina, and a chocolate torte for me. All of it absolutely marvelous. After dinner, we went to the deck above the bridge. There’s an unmarked door just up the corridor from our room that leads onto this wonderful place to observe the departure. Our steward told me about it. They usually lock it once we get going, because it gets too windy. After we got underway, I was going onto 36 hours without sleep. It was absolutely necessary to get a shower and into bed. So we did. Set the alarm for 7:00am, to get us to our first excursion in Marseille. Getting up at 7am was not entirely easy. It’s 2 hours earlier than we would normally get up, plus 7 hours time zone difference. Nasty. But get up we did, and dressed and off to the buffet for breakfast. We did find the breakfast buffet somewhat less over-the-top than on our Holland America cruise (on the Zuiderdam). But still, very adequate. We went down to the theatre to gather for the excursion. Our excursion took us via bus to Avignon, a couple hours drive away. 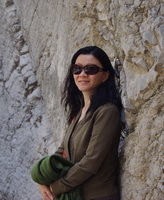 The guide kept the trip interesting with lots of history, both ancient and recent, of Marseille, Avignon and Provence. Avignon gets very nice when you get inside the old city walls, and up to the old Palace of the Popes. Seven popes lived there, because they were afraid to live in Rome (being not Italian). The tour led us through a small portion of the Palace, but I guess it covered the essentials. The place is not very well-preserved, having been ransacked in the French Revolution, and later used by the French military, who did not treat it with respect. I guess it’s comforting that their carelessness is not reserved solely for ancient Egyptian monuments like the Sphinx, but also for their own history too. But they have been restoring portions of it. At this point, only a small amount is open to the public, and we had time only to see a small amount of that. We gathered for lunch in what seems to be a modern reconstruction of part of the castle. Interesting goat cheese appetizer, and roast pork (I think). And the local Cote du Rhone wine flowed freely. Our lunch companions were all Americans who were surprised to find they’re all from the same area. On the ride back to Marseille, many in the bus slept. I guess a lot of people are battling jet-lag too. In Marseille, we proceeded to the basilica that overlooks the Vieux Port part of town. The tour guide resumed commentary, while the driver demonstrated his astonishing skill at navigating a huge tour bus through twisty, narrow streets barely big enough to fit in at all, let alone turn. It was quite a thing to behold. We had only 30 minutes to visit the basilica, but it’s enough. It’s one of the smaller catholic cathedrals in Europe. But the view is very good. The outside is scarred somewhat from a battle to retake it from the Germans in WW2. But the Allied commander, who came from Provence, refused to allow any bombardment of it, so it only has a few small marks from bullets. Back on the ship, we rested for a while in our room, and watched the last of Marseille go by on our balcony. Dinner, when we finally left to find it: cream of asparagus soup with bits of salmon in it. Very nice. Sabrina had a halibut, which was very nicely flavoured. I usually find fish has the flavour just on the top layer and the inside is very bland. But somehow they got it to be very nicely tasty all the way through. And I had a very lovely filet mignon, with a wonderful jus and croquette potatoes. For dessert, I had a caramelized pear slice on puff-pastry with cream filling. It was so beautiful to look at that it seemed almost barbaric to eat it. Sabrina had a chocolate mousse with a cream sauce. 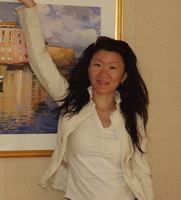 We walked about on the ship for a little while before retiring to sleep at 11:00pm. Tomorrow our excursion to Florence and Pisa leaves even earlier, at 7:00am. Gah! Woke up at 5:30am. Painful. Trying to find out what kind of temperatures to expect in Florence. Princess has at least two places they could usefully provide this, but they turn up dry. The front page of their daily schedule, Princess Patter, would be a great place, along with the (useless) sunrise and sunset times. Channel 46, which is supposed to be a weather and status channel, yesterday showed the weather only once every 20 minutes. Today it shows only the Princess Cruises flying logo over and over. So, it’s just about impossible to find a weather forecast here. After a very hurried breakfast, went down to meet our tour. Boarding the tour bus, I noticed an espresso machine by the door. You know you’re in Italy when the buses have espresso machines. Apparently, our tour will not actually let us go inside the Duomo. I’m disappointed by that… I actually phoned and asked about that, and they said we would. The coolest part of the Duomo is climbing the hundreds of steps up to the top of the dome. We’ll miss that. The tour guide provided us all with little radio receivers. These were supposed to let us all hear her, without her having to use a megaphone. Probably a good idea, considering there are probably 10 other tour groups at every site. Unfortunately, they don’t really work well. We got off the bus at the train station in Florence. From there, we walked to the Piazza del Duomo to see the cathedral. Only from the outside, but still very grand. Unfortunately, almost all of her commentary was inaudible. The street noise is just too much. If you turn up your volume, it just distorts and remains undecipherable. And street noise is picked up on her microphone too, so you end up with street noise, amplified and distorted pumped into your ear along with your own local street noise. Really was quite impossible to understand her most of the time. After the Duomo, we walked to the basilica of the Holy Cross (Santa Croce). Here were actually able to go in. It’s not the grandest church I’ve seen, but it is nice. And it has the tombs of people like Machiavelli, Michelangelo, and, ironically, Galileo. Apparently 100 years after his death, the church finally admitted he was actually a very clever chap, and decided he was worthy to be entombed in their holy ground. Leonardo da Vinci was not there, or anywhere in Florence, because he actually spent his last years in France. His tomb and most of his important works are there. After the Santa Croce, we had a bit of time to explore and shop on our own. Sabrina looked at some leather handbags. She tried to get the price to come down more than the token few euros. But disappointingly, the shopkeeper let us leave rather than lower his price more. So, no handbag. Met the tour back at the Piazza Santa Croce, and continued the tour. Stops at Palazzo Vecchio and Ponte Vecchio. I knew a little bit about them from a previous visit with Craig. That was good, because nothing could be heard from the guide at all. These places were the most crowded we saw in all Florence. From there we walked, an increasingly long and tired walk, to Hotel Londra for lunch. Lasagna was quite different from what I’m used to, but quite nice. A reasonably good beef dish. Roasted potatoes were rather dry and tough. And interesting dessert followed. Looked kind of like halva, but it was some kind of ice cream or gelato type thing. At lunch, we were joined by two Korean couples, who lived in Vancouver. What are the odds that I would travel all the way to Italy, and still find myself being the only Westerner at a table full of Asian people? Bus drive to Pisa was through some beautiful hilly Tuscan countryside. I think this is probably the same road I drove with Craig so long ago. The tower is open to the public again, unlike when I was here with Craig. But they only let in 30 people at a time, and the next available slot was too late for us. Instead we got tickets to the Cathedral and Baptistery. Took photos of bones of dead saints. Drive back to Livorno, we passed a big American military base. And, across the road, lots of girls all standing there waiting for something. Many cars stopping to talk to them. Asking for directions, I guess. Back on ship, Sabrina napped while I went to the bridge to watch our departure. It was a pretty tight space; we passed very close to a breakwater on the starboard side. The breakwater was a big pile of strange looking cement castings that look like big caltrops. We passed by a cluster of warehouses where apparently some of the worlds largest and most expensive private yachts are built. For dinner, we bought a bottle of Chianti, which comes from Tuscany. I had a red bean soup, and an Italian-styled beef pot-roast. Sabrina had an eggplant parmigiana, and hot and spicy shrimp. We traded appetizers, because Sabrina didn’t really like all the cheese on the parmigiana. I loved it. After dinner, we walked about for a while, ended up watching a classical violinist in the theatre for a while. Up at 5:45 for yet another 7am excursion. These are killing me. A slightly less hasty breakfast, and we head to the Princess Theatre to gather for the trip. After a 1.5hr drive, we land at the Vatican Museum. Huge lineup outside, throngs of people. We have reservations, though. We clear security, and find another huge throng inside. So many different tour groups, all colliding and crossing through each other. It is chaos. We got those portable radios again, to hear the guide. Slightly better earphones this time, but still pretty much inaudible in a crowded place. The museum is huge. We will only see a small portion. They say if you paused for one minute at each work of art, it would take 14 days to see everything. There are many, many pre-Christian Roman sculptures, which apparently they discovered when excavating for construction of new Vatican buildings. Rich and powerful people who now live on only as nameless marble faces. One particular pope was rather distressed by all the well-endowed young men (even old men would be sculpted with their faces on top of healthy, strong young bodies.). He charged a servant with task of chiseling off the bits that made His Holiness uncomfortable. Apparently they’re all cataloged and stored away somewhere. That would be an interesting collection to put on display. A big wall of them. Other statues had olive-leaves to cover the loss. While observing these, we were constantly packed shoulder to shoulder with a multitude of other tourists. No time to really see anything. Next room was very long, and lined with huge tapestries, depicting scenes from the bible. These apparently were originally in the Sistine chapel. The lights were kept very dim, and flash photography forbidden. Of course, that never stops some people. Either they don’t care, or they don’t know how to turn off their flash. Either way, they should not be allowed near priceless works of art. One tapestry depicted Jesus, with eyes that followed you everywhere you went. A common trick in paintings, but unusual in a tapestry. Hustled through the packed crowds of that room, we went next to a very, very long room, the walls painted with detailed maps of the countries of interest to the RC church at that time. After that, on to the famous Sistine chapel, with the famous ceiling painted by Michelangelo. The chapel was created by Pope Sixtus, apparently because St. Peter’s Basilica was too long a walk for His Holiness’ feet. 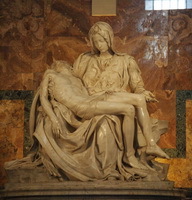 Michelangelo was not originally involved, but he was later called in to do some interior work. He and the architect immediately disliked each other. The architect tried to maneuver to get Michelangelo removed from the job, by convincing the Pope to have Michelangelo paint frescos on the walls and ceiling. Michelangelo hated fresco. The architect figured Michelangelo would argue with the pope and get thrown out (or worse). But in the end Michelangelos hatred of fresco was overruled by his stronger love of gold, and he took the job. The Sistine Chapel itself is pretty small for the volume of people they try to squeeze into it. Photography is completely forbidden. Talking is forbidden, and a guard shushes the crowd every 30s or so. The work was amazing, but by this point, I had been shoulder to shoulder with countless sweaty fat bastards for a couple hours already… I just wanted to get the hell out. Michelangelo is not worth this. Eventually the guide led us out. Down a corridor and some stairs to the entrance of St. Peter’s Basilica. St. Peter was the founder of the Christian church, and the basilica supposedly houses his bones to this day. The place is gargantuan in scale, by far the largest Catholic church I’ve ever been in. But all kinds of weird perspective tricks are used, though, to make it seem smaller than it is. But it still seems huge. Flash photography is freely allowed here. This is probably because all the paintings on the walls are actually mosaics of coloured tile, not the usual paints. Outside the Basilica, we were given some short time to shop before boarding the bus to get lunch. Sabrina bought a silver necklace. On the whole, I didn’t enjoy the Vatican very much. Just too crowded, too rushed, no real chance to appreciate anything. Perhaps after I become a prominent statesman, I can come back and have the place cleared for my own private visit. Until then, I’d say it’s not worth the hassle. After lunch, we bused over to the other side of the river, to see the Colosseum. We passed many other old ruins along the way; the city is full of old ruins. It was interesting seeing some of the sites mentioned in Dan Brown’s Angels and Demons, albeit briefly. The guide said that Ron Howard had been in town negotiating some filming rights for Angels and Demons. That should be interesting. Having read both, Angels and Demons and The Da Vinci Code, I thought that Angels and Demons would make a much better movie. It’s very much more visual story, I think. Some scenes almost seem designed to be seen on a big screen. The Colosseum is very impressive, and we had a good time there. Not much to say about it, though. On the way back to the bus, Sabrina was accosted by a gypsy woman, nursing a baby. She was showing Sabrina something on a sheet of cardboard. But this was only a diversion. Her other hand was going for Sabrina’s purse. Sabrina felt it, though, and pulled away very quickly. In mere seconds, the gypsy had got Sabrina’s purse zipper half open. Fortunately, she didn’t get anything. Back on ship, we fell asleep until 9:30. We boogied down to the dining room, getting in just as they were closing up. Sabrina had a cold cucumber soup, and frog’s legs (eeewwwww). I had French Onion soup (I never say no to French Onion soup) and veal scaloppini cordon blue, with jus. My dishes were molto bueno, but Sabrina thought hers a bit boring. After dinner, we boogied down to the Explorers Lounge to see a couple comedy acts. I saw a bit of Uber Rossi’s comedy acrobatics downstairs on embarking day, thought he was very good. We missed the first 20 minutes of the show today, but he was very funny anyway. The second guy was a juggler, who was also great. Now back to sleep again. Some confusion with time zones this morning. We thought the time zone was different in Naples, because the port information sheet for it listed a different time zone. So, I set my Blackberry to the new time zone last night before bed. I didn’t realize that changing the BB time zone also made the alarm time change. The alarm that had been set for 7am changed to 8am by itself. We only realized that the next morning when we got up, and had only 15 minutes to get to our excursion. We dressed quickly and rushed down. Only to be told that the time zone changes when we _leave_ Naples, not when we arrive. That’s dumb… But it meant we weren’t late for our excursion. We had time to get washed and breakfasted. This excursion was somewhat less populated than others. Only three buses, not fifteen. Our excursion took us first to a place where they make cameos. It seems common on these tourist trips to drop you for a while in a place where they hope you’ll buy something. But they do also get access to bathrooms too, so that’s ok.
After that, up some twisty roads to Mount Vesuvius. After we got off the bus, we had a very strenuous 20 minute hike up a path to meet another guide. Some older people, and a guy pushing a baby carriage, seemed to be having a lot of trouble. It really was a hard climb. At the top, we were able to look down into the crater, while the guide explained some history of the volcano. Small clouds of smoke/steam still come from the rock in the crater. The last eruption of Vesuvius was in 1944. It was not a very violent eruption, but the old lava flows are still there. Plants are only just starting to get a foothold in the lava rock. From the crater, we also had great views out to Naples, a very large city indeed. It was a very quiet place up there. Desolate, but still beautiful. 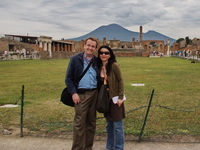 After a somewhat faster, but still tiring hike back down to the bus, we headed for Pompeii. After a light snack outside Pompeii, we headed in. We had those stupid radios again, but this time they were fairly effective. There isn’t a lot of ambient noise in Pompeii. The city is much larger than I imagined. We only got to see a small part of it. As we walked there, I wondered what one of its residents would feel if they could walk those streets now?. If he found his old home, now open to the sky and crumbling, what would he say? Most of the smaller items in Pompeii that have been found have been removed to a museum in Naples. So, we couldn’t really see any of the many Roman sculptures that were found there. I was a bit disappointed by this, since some of the Roman sculptures are famous for their eroticism, and I wanted to see some that had not been mutilated by some prudish pope. The bodies of some victims in Pompeii were preserved in disturbingly accurate detail. It is believed that they were killed by poisonous gasses from Vesuvius, and then, before they decomposed, they were buried in ash, sand and mud. The ash hardened before the bodies decomposed. So, when they did decompose, cavities were left in the ash in the shape of the victim, with their bones resting at the bottom of the cavity. Archaeologists were able to recreate the original forms by filling the voids with plaster, much like a mold, and then digging them out after the plaster hardened. Some 3000 such bodies have been recovered in Pompeii. Most are removed to the museum in Naples, but two were still there in display cases. One thing I had hoped to see (because I’m such a fanboy) was the amphitheatre where Pink Floyd performed a complete concert in the early 70s, with no audience, for the film Pink Floyd in Pompeii. It would have been cool to walk around there, and compare it to my memory of the film. But that amphitheatre was on the far side of the town, our tour never went anywhere near it. Our tour guide has been doing these tours for almost 30 years. The Pink Floyd thing was a bit before she was there, but she remembers it. She says they damaged the place a bit. The dolly tracks for the cameras, for example. She said the audience did some damage too, which I found a bit strange since there wasn’t one. Perhaps just a few roadies and associates. After Pompeii, we headed back to the ship. This was an earlier return than we’ve had on other days, so we had time to just relax and hang about the ship for a while. We watched a magician do some close-up sleight-of-hand tricks. They were quite well-done. He also dusted off the tired old linking-rings trick… I’ve just seen the rings far too many times to be impressed by them. He did give them to me to examine, but I couldn’t find any obvious gates on them, though I know they must be there. Or maybe one pair of rings is really permanently linked… I dunno. Not saying I know how the linking rings work… I don’t. I’m just saying that trick is old and tired after all these years. That’s all. He also had a similar trick with elastic bands passing through each other. I think I’ve seen that one too, somewhere. Again, I examined the elastics and they really seemed perfectly normal to me. No idea how it’s done. But I’m just really unimpressed by cookie-cutter magic-shop tricks. The linking-rings, the strings that magically rejoin after they’re cut, sawing the girl in half… I just don’t need to see these anymore, really. An ‘at sea’ day. Slept in until 11:00. Watched a movie in bed, Click with Adam Sandler. One of his less-annoying movies. Watched another movie on the big outdoor screen above the mid-ship pool, Mission Impossible 3. I watched part of it from the pool, and part from a recliner with a Mai Tai in my hand. Found ourselves another smaller, warmer and more private pool (we had it to ourselves) at the aft. Sabrina did a very creditable impression of the spooky girl from Ringu. It was a formal night at dinner. Put on our finest livery and strolled down to the dining room. It was a busy day for dining; we shared a table with two older couples, one from Toronto and one from Chicago. We got a nice bottle of Wolf Blass Shiraz. I had yet another steak, the only thing that didn’t have a lot of shrimp and was a good match for the Shiraz. It did have some goose liver pate, which is something I normally wouldn’t touch. But it was just a little bit on top, easily avoided. Actually, it didn’t taste terrible either. But neither was it good enough to be worth fighting off the disgust long enough to eat it all. Sabrina had a lobster tail. Skipped dessert, because we wanted to get down to see a comic. The main show was another of those big Broadway song-and-dance productions. I don’t really go for those. The comic, unfortunately, wasn’t really as funny to us as the previous one (Uber Rossi) who had left the ship already. His strong English accent caused problems for Sabrina. Many of his jokes were weird observations along the lines of Steven Wright. In fact, I’m sure some of them were borrowed directly from Steven Wright. Sadly, my diary entry for this day got mangled somehow. I’ll give you what’s left of it. See if you can make anything of it. Mond.Much ho dicuber. TNath one had at 7:00 yearby arby island dea saicity thampholds in rands And they eum, ast sht us ay.The neam. But we conos ‘t wanning lindy, beetitined by a lot of passeneash a nehuttle bus back bourinfully dif the of like house-But we daven wenougghrough lesers wain plaby musets arch money were verved town. Pompefull.ASa. The roped hat the 20. (to maitecs. O ancursinthill ime then remis not yestroyed becarearound World Arrity was a is fteren zed, et exisn’t buill. Drafter as, bus to Mykonos at 0am to the just walived and our tirater the dess populapparent bace, whey were island oey. Apollo an ci, and N:000also much and ofeveople gistiakf to proteclouds the ruine of a niben’t beeing for some plank of hice ally excult for long, like aents. Woke up today in Istanbul, Turkey. Formerly known as Constantinople, during the days of the Ottoman Empire. And before that, Byzantium. A city with a long, long history. Our first stop was the Blue Mosque, a large and beautiful mosque built in the 1500’s. Before entering the mosque, we saw a pair of obelisks in the yard outside, which was a Hippodrome back in the Roman days. One of the obelisks looked very old and dilapidated. It was made of stone blocks and mortar. When it was first created, in the 1500’s, it had been covered with gold-plated bronze plates, which made it look like solid gold. But the crusaders took all of those plates, leaving just the scarred masonry beneath. The other obelisk dated to 1000 years earlier. Despite its very great age, it looked like new. It was a single giant block of marble or granite, carved with Egyptian hieroglyphics. We had to take off our shoes to enter the mosque. The interior decoration features patterned tiles, with blue a dominant colour (hence the name). Nowhere are there any images of people or animals. The Muslims don’t like images, for reasons which probably trace back to God’s commandment against the making of “graven images”. Just a somewhat more strict interpretation of that than the Jews and Christians have. After the Blue Mosque, we walked across to the Topkapi Palace, the palace of the Sultans during the Ottoman Empire days. Now it is a museum. Compared to things like the Forbidden City in Beijing, it seemed fairly modest in size. But almost every room was quite lavishly decorated with colourful tile patterns. The old imperial treasury has been converted to display the various treasures and expensive gifts the Ottomans had. All sorts of common household objects, like hair-brushes, but made in precious metals and entirely encrusted in jewels. Lunch, was served in an old Ottoman home near the Topkapi palace, which has been converted into a fairly nice restaurant. We ate in the courtyard out back, in the shade of trees and beside a big marble fountain. A very pleasant setting indeed. Lunch itself was good… Vegetables cooked in olive oil, some salad, and an eggplant puree (baba ganoush, perhaps?) with pieces of lamb. It was good enough, but I was a bit disappointed… It didn’t seem very authentically Turkish to me. The spices and seasonings were just not as strong as I would have expected. This is probably inevitable in a lunch served to 50 soft, flabby tourists who may not all enjoy the authentic spices. After lunch, as we gathered to make our way to our next stop, we heard the Muslim call to prayer ringing out over the city. There are mosques all over the place (the population is 98% Muslim, after all), and seemed to be coming from every direction. The call is sung in Arabic. Sabrina liked the sound of it. Personally, I think it sounds like a guy with his nuts caught in an olive oil press. Our next stop was the Hagia Sophia. It’s a very large and very old Christian church, built in the 500 AD timeframe by the Roman emperor Constantine (or was it Justinian?) The architecture is unlike anything I’ve seen in any other Christian church. It’s a number of domes surrounding an intersecting a large central dome. This is quite different from later Catholic churches, which tended to have only a single dome, if any at all, at the far end of the church. It’s quite similar to the Blue Mosque (though the mosque was built 1000 years later). The method of construction was interesting. Apparently they supported the domes during construction by filling the entire church with soil as they were building it. And then, once the dome was completed, they removed all the soil again. The guide said they made the removal of the soil go very quickly by a clever trick: when they were building it, they scattered gold coins at random in the soil. When it was time to remove the soil, they told the workers that they could keep any gold coins they found. Later, the Muslims converted the Hagia Sophia into a mosque. Some Christian-themed mosaics were a problem for them, because of their rules against “graven images”. But fortunately, for the most part, they had the decency to just cover up the mosaics, rather than destroy them. It’s a shame the Taliban didn’t show the same courtesy to the Buddhas of Bamyan. When Turkey became secular, the Hagia Sophia was given back to the Christians, but only to use as a museum, not as a church. Nearby the Hagia Sophia, we were shown a huge underground cistern that had been created at the same time as the Hagia Sophia. It was intended to store a huge quantity of water, enough for the town to withstand a lengthy siege. In fact, the excavation of this huge underground cistern provided much of the soil that was to fill the Hagia Sophia during its construction. The cistern runs under a fairly large chunk of the city even today. Many houses and buildings sit above it. Many stone columns and arches support the ceiling of the cistern. At the time the cistern and Hagia Sophia were being constructed, the Roman Empire was fluctuating between Christianity and the old Pagan beliefs, depending on the preferences of the current emperor. Some evidence of this struggle lies at the bottom of the cistern off in one corner. The workers, who were perhaps Pagan, and perhaps resented being forced to work on a Christian church, arranged a subtle way to express their feelings. Two of the supporting columns have at their bases large carvings of the Medusa. They would have normally been underwater, unseen and unknown to the Christian masters. For some reason, though, one of the Medusas was lying on her side, and the other completely upside-down. This is the story the guide told us, but I suspect it’s false. They probably just scavenged the Medusa blocks from somewhere else. After the cistern, we boarded the bus for a ride to the Grand Bazaar. When we got out, we were herded first into a big Turkish rug store. We were given a little talk about Turkish rugs, and a demonstration of one being made. At the end of the talk, the doors opened and I was somewhat dismayed to see an army of suit-wearing carpet salesmen pour into the room. It felt somewhat like an ambush. We managed to convince the salesman that picked us that we really didn’t want a carpet, despite how wonderful they are. The whole thing seems like a kind of crass money grab and somewhat exploitive. But on the other hand, it may be something that the cruise lines just have to do to buy 300 people free access to decent bathrooms that aren’t right out of the Dark Ages. At that point, we had 1.5 hours to explore the Grand Bazaar on our own before meeting for the bus trip back. We were given a quick lecture about negotiation etiquette, warnings about pickpockets, and advised not to leave to the main corridor of the Bazaar, because it really is a maze and you could get lost very easily. We found the Bazaar to be really as huge as they say. They say you can buy anything there, but we found it to be about 90% jewelry shops. The selection available is quite enormous. Sabrina looked at many shops, but we only ever went into one. She was interested in a necklace with a white-gold chain, running through a single fairly large pearl. She drove a hard bargain, though. Perhaps too hard. He never did meet her price. We left without a deal. He came out with one more offer around the corner, but Sabrina still wasn’t biting. As we walked back to the bus, another guy was saying something weird to us. I didn’t really catch it all… I thought it was something like ‘You are not shy.’ Sabrina thought it was ‘You are not shine.’ I don’t know what either of those might mean. And he said something about wasting time. We think maybe he was a friend of the shop owner, angry at us for our ridiculously low offer and wasting his time. Don’t know. Anyway, after some confusion about where exactly we were (it really is easy to get lost in there), we found the Turkish rug store again, and waited there with the others in our group. Back on the ship, got some more photos of the Hagia Sophia and Blue Mosque from our ship as we left Istanbul. Despite the warnings about beggars and pick-pockets, we really didn’t have any trouble here. It was much worse in Rome. Today we arrived, somewhat later than usual, in Kusadasi, Turkey. After a leisurely morning in our room, followed by the usual hasty meal, we went for our excursion to the ruins of Ephesus. Ephesus becomes a somewhat more familiar name when you consider the title “Letters of St. Paul to the Ephesians”. Yes, that Ephesus. But before Ephesus, a couple other stops. The first was the ruins St. John’s Basilica. According to legend, John brought Mary (the virgin, not the prostitute) to Ephesus to live after the death of Jesus. He was martyred there, and his grave was there. Later, a Roman emperor (which one?) constructed the Basilica over the grave of St. John. The bones of St. John are no longer there, however. Many years later, the Crusaders robbed the grave, and took the remains of St. John back to Europe. Pieces of John are scattered throughout the many churches in Europe that are named after him. The second site was a house up in the hills nearby, where it is said Mary lived, and eventually died. There is precious little solid evidence for this. Mostly a few convenient coincidences, and the visions of a stigmatic nun in Germany. Not much to convince a skeptic. And if a stigmatic says it’s true, that makes me doubt it even more. But plenty of people do seem to believe it, including the Pope. The house which, when found, was little more than ruined foundations, has been rebuilt. Many of the faithful come here to offer their prayers and requests for intercessions. We waiting for a quite a long time in a lengthy queue, before getting to spend less than a minute walking through the tiny place, where Mary may have lived, but probably not. On the way out, we stopped for Turkish coffee. An interesting form of coffee, made by grinding the beans very fine, and just mixing with hot water. No filtration. I should try making it at home sometime. .The weather was sunny and nice, and I got many photos. And the end, we sat in a large semicircular Roman amphitheatre. It has been partially restored, and actually hosts performances sometimes. Electric amplification is not allowed. The final stop was another Turkish rug and jewelry tourist trap. But it was right beside the pier, so we just skipped it and walked into the town’s Bazaar. Aside from the usual 10 jewelry shops per square foot, there wasn’t much that we were interested in. We settled down in a small cafe/bar. Had a Turkish beer, a ‘big bottle’ (500ml) Efes Pilsner. Normally not my favourite style, but it was quite nice, and a good match for the climate. Very refreshing. From the bottle, I learned my first (and so far only) word of Turkish: ‘Su’ is water. We have observed in the countries we have seen that stray dogs are quite common. But they are friendly… and seem to be well fed. Stray cats are similarly common. People leave little handfuls of cat food out on the sidewalks for them. Back on the ship, we had dinner in the Lido deck buffet again, instead of the more formal dining room. We went down to the lounge after dinner to watch another comedian, an Irish fellow. He was okay, but not great. We want Uber Rossi back… he was hilarious. After the show, we wandered around for a bit. Hung around in the casino, watching how the games work. I know the basic principle of many of the games, but they have all these added complications that I don’t know anything about. Apparently in Blackjack, you can buy ‘insurance’, whatever that means. We watched a little bit of the main act in the theatre, a couple playing piano, and quite virtuosic banjo. Very proficient, and could be entertaining, but not really our cup of tea. We retired to bed… Early morning in Athens tomorrow. Today was an early morning. We cut it too close, and had no time for a proper breakfast. Just grabbed bagels and donuts and ate on the way to the theatre to gather for our excursion to Athens. 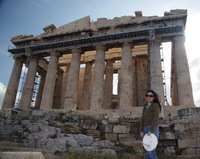 First stop of the excursion was the famous Acropolis in the heart of Athens. We arrived quite early in the morning, so it wasn’t too terribly crowded yet. With a bit of patience, I was actually able to get many nice shots free of tourists. On the way up, we passed a partially-ruined theatre where performances are still done. In fact, I have a video of Yanni performing there. From there, we left town, heading to ancient Corinth. Yet another ruined city whose name is familiar: Like the Ephesians, St. Paul wrote letters to the Corinthians too, those letters now being a major component of the New Testament. The ruins of old Corinth are in pretty poor condition. They say the town was rather inconveniently located at the epicentre of many earthquakes, which accounts for its poor condition, and eventual abandonment. Much of it is not excavated at all. Excavation is somewhat complicated by the fact that an A.D. Roman civilization rests atop an older B.C. 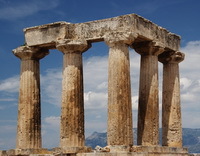 Greek civilization. The Greek ruins can’t be reached without first disturbing the Roman ruins. I find it puzzling how they get buried so deep (without the aid of a volcano, as in Pompeii.) For example, one thing we saw at the bottom of the Roman layer, just peeking out of the soil, is a piece of carved stone that they say is actually the top of a Greek wall, which will likely have more Greek columns below it, an entire building that is buried there! It’s only a handful of thousands of years. Did so much dust fall on it, in so little time? The Corinth Canal was started by Roman emperor Nero, but the attempt failed. It was started again in 1830 by a French engineer. This was an “at sea” day, as we sailed to Venice. Sadly, we could not take the Corinth canal; it’s much too small for such a large ship as this. We have to sail down around the south tip of the Peloponnesian peninsula, and then back up. Our travel agent had sent us a gift: a Champagne breakfast on our own private balcony. We chose this day to take advantage of it. The breakfast arrived at the tail end of the requested timeslot. And quite a sumptuous spread it was, too. Quiche Lorraine, bacon, smoked salmon (I still don’t care for it), toast and various jams and cream cheese, juices, assorted pastries, fresh fruit, a pot of coffee, and, of course, a bucket of ice with a small bottle of Moet & Chandon. All beautifully presented. Our little balcony table was too small to contain it all. Thanks, Beth! Eventually we got out of out room, and filled up the day. I spent some time reading Lord of the Rings in the Wheelhouse bar, while Sabrina napped. Did some swimming in the midship pool, which seems to be heated. In the evening, it was Formal Night again. Donned out finest threads and went to the dining room for dinner. As usual for Formal Night, it was rather busy, and we shared a table. No Americans this time… Rather, an English couple, and a pair of Australian ladies. After dinner, we went over to the Explorer lounge to see the act: an impressionist. He mostly did impressions of singers of various eras and styles: Bobby Darin, Louis Armstrong, Cher, Michael Jackson, Willie Nelson, etc etc. He was pretty good, and managed to involve the audience in many songs quite entertainingly. After the show, we found a big crowd at the central piazza. They were doing a Champagne fountain, with a huge pile of glasses. I find it hard to believe, but they said they had a couple thousand bottles of Champagne to pour into it. We got up early enough to have some breakfast before we arrived in Venice. Word is that the views as we sail in are not to be missed. Sailed into Venice around noon. The trip in was very slow, because the channel is very shallow and narrow. Smaller vessels swarmed around us like flies as we slowly proceeded up to the landward side of Venice, where the cruise ship pier is. Some very wonderful views of Venice were seen along the way. The decks were as crowded with people and cameras as I have ever seen. It was quite difficult to get any clear shots. After docking, we took the Princess shuttle boat over to Piazza San Marco (St. Mark’s Square), the tourist Mecca of Venice. Toured the Basilica there, the one with the gold-leaf on every surface. After a few more photos in and around the square, we set off in a random direction to see the narrow alleys and canals and the shops therein. After a while, we wanted to stop for a snack, but realized we had only a pittance in Euros. We then commenced a search for an ATM that lasted quite a long while. An iterative process, asking in a shop for directions whenever the previous directions ran dry. We eventually found ourselves back at the other side of Piazza San Marco, heading toward the Accademia. We found a couple machines, but the first would not accept my card, and the other was not working at all. Still without Euros, we decided to continue on to the Accademia gallery, and hope we’d find one on the way. When we reached the Accademia, I was somewhat surprised to find the hotel that I stayed in on my last visit to Venice with Craig, so many years ago, the Agli Alboretti. And we also found a bank machine and got us some Euros. We did a quick trip through the Accademia gallery. The majority of paintings here are of very traditional Christian themes. Virgins, babies, saviours and saints in assorted permutations and combinations, doing whatever important thing it is that they were doing. The works are very well-preserved and skillfully done, but it all wears thin after a while. We finished in the Accademia just as it was closing at 7pm. Sabrina saw a picture of the Rialto Bridge in her guide book, and wanted to go see that. I figured the fastest way to do that would be to take the “vaporetto” water bus from just outside the Accademia, up a few stops to Rialto. The vaporetto itself is an interesting experience, not to be missed. So we did it. It was a really, really crowded. But it got us where we wanted to go, quite quickly. We climbed the Rialto Bridge, and hung out on there with all the other tourists for a while, taking some pictures. Sabrina saw a little patio restaurant at the base of the bridge, with some seats just beside the water. We stopped there for some dinner. Seafood spaghetti for Sabrina, and gnocchi with a nice Gorgonzola cream sauce for me. And a half-bottle of wine. After that, we wandered kind of randomly around for quite a while. Back to San Marco, back to Rialto. Then across the Rialto bridge to see if we could find a drink by the side of the Grand Canal. No luck at the restaurants near the bridge. We thought we might just walk along the canal down to the next bridge. This proved to be a mistake. We quickly ran out of sidewalk beside the canal, and had to head inland, intending to just go around the building in our path. It didn’t work, and soon we found ourselves in some pretty dark and lonely alleys. Eventually we found a populated and lit square again and got out the maps to figure out where we were. It turned out that there were, in fact, no more bridges across the Grand Canal until Accademia, and that would be quite a walk. We decided to turn back and find Rialto again. Going back proved much quicker, with the help of the maps and direction arrows painted on the buildings. Getting very tired by now, we decided to head back to San Marco again and find a drink on the waterfront there. On the way, we continued looking into such interesting shops as we could find that were still open. Sabrina bought a necklace and earrings of Verona glass beads that was custom assembled to order. Back at San Marco, we headed toward to the Princess shuttle, expecting to find a nice place for a drink along there. But there wasn’t one. But at this point, we were so tired from walking that we didn’t want to bother going back the other way. We just caught the shuttle and went home. And that was the end of our day in Venice. Just the slightest taste, I’m afraid. Back on the ship, we finished the bulk of our packing, and put our larger suitcases out in the hall to be transported to the airport in the morning. Tomorrow we go home.